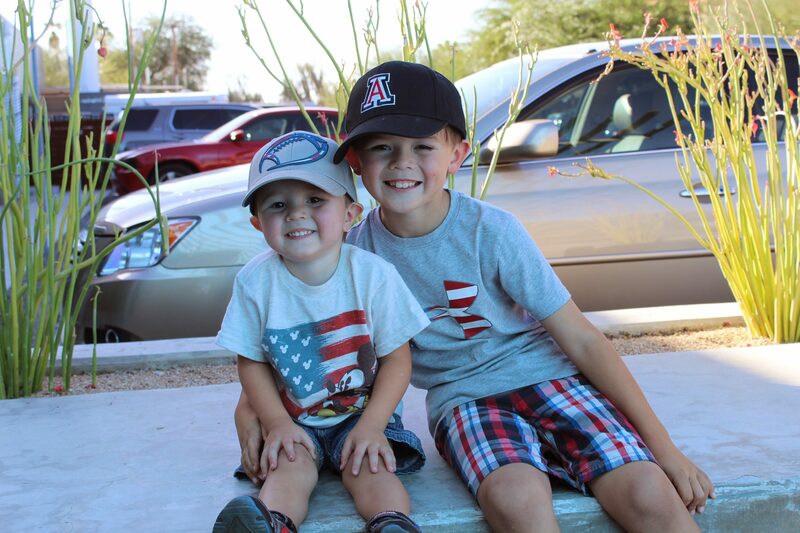 Serving in the army can mean moving often, and after ten years of service, Richard, Jennifer and their two sons, Brayden and Landon are ready to settle down in Tucson. “There’s turmoil and anxiety that comes with moving a lot,” says Richard. Richard was born in Philadelphia, grew up in Florida, and graduated high school in Ohio where he subsequently joined the army. Jennifer has lived in Tucson since her freshman year in high school. When the two met, they were living in different states but stayed in touch via email. 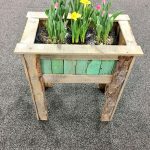 Through email, they shared stories about their childhoods, discovered that they both grew up in military families and formed a connection that would solidify a strong bond when Richard was deployed to Iraq the first time. 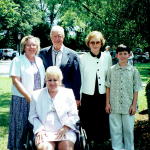 When Richard returned, he and Jennifer got married and embarked on an almost nine-year journey of frequent moves, deployments and the births of their two sons. 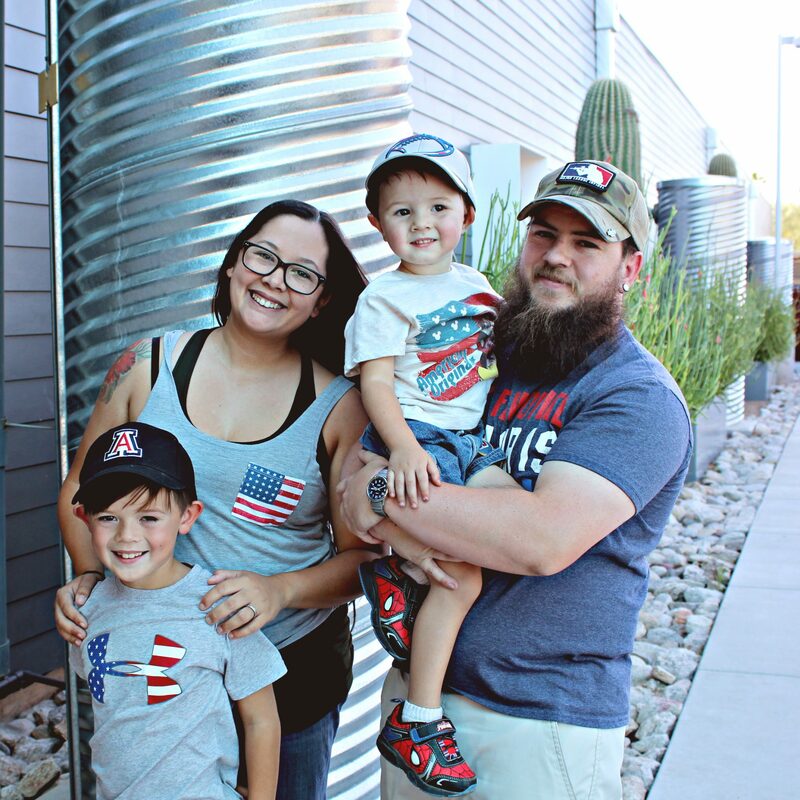 When Richard was discharged, the family moved to Tucson and moved in with Jennifer’s parents to save money. Both of Jennifer’s adult siblings were living at home at the time and the four-bedroom home felt crowded with nine people living in it. They currently live in a small two-bedroom apartment and didn’t think homeownership was even an option for them until their counselor at the Veteran Rehabilitation Center recommended that they apply for the veteran home. “My first reaction was, ‘I can give you at least twenty names of veterans that are more deserving of this than me,” says Richard. He feels fortunate to have a roof over his head and a supportive family. He thinks of some of his fellow veterans who are homeless or living in cramped conditions. Richard and Jennifer’s apartment is comfortable but just out of their price range making it hard to save money. “We were preparing to be rejected from the Habitat program but when we got the call that we got accepted I just started crying. It didn’t feel real until we went to World Habitat Day and saw all these volunteers working on our house. When we started hammering nails to the wood that will be the walls of our home, then it felt real,” says Jennifer. “No words can express the gratitude I felt,” says Richard. 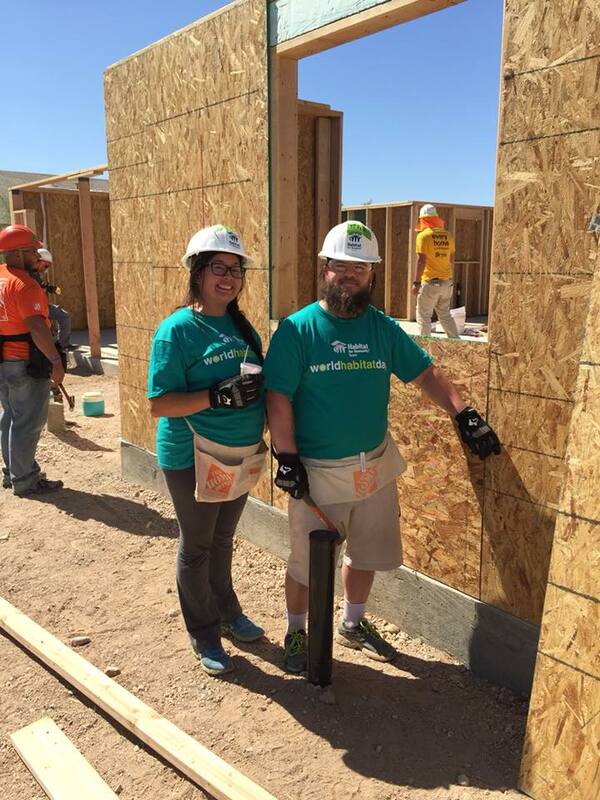 Now working towards completing their sweat equity hours and taking classes while balancing work, school and raising their two boys, Jennifer and Richard are drawing on their inner strength and defining what the core values of Habitat for Humanity means to them through this experience. “I think strength, stability and self-reliance all coincide. Strength to me means being strong enough to do everything you’re already doing and then taking this program on, on top of that, and making it work. Stability to me means to endure, to continue to make it work,” he adds. Self-reliance is especially meaningful to Jennifer. “Since we’ve been married, we’ve had the comfort of the military and the support of my parents. This is our opportunity to truly be self-reliable. To work together and do it ourselves,” she says. And they are proving to themselves that they can do it. “We figured out a system. We already have fifty hours between us,” says Richard. Jennifer balances raising their kids, managing their son’s football team and working as a dental assistant, which she loves. “Not many people can say that they love what they do so I feel really fortunate to have found my calling. I love the work and the people I work with.” She has also volunteered for Hope Network Inc. at Hope Fest where she utilized her knowledge to help underserved and marginalized populations. Richard is finishing his general education at Pima Community College so that he can begin a degree majoring in psychology and eventually counsel fellow veterans. His service had a deep impact on him and he wants to help as many veterans as he can. Growing up with a grandfather and uncle that both served, hearing their stories and seeing friends join, Richard felt compelled to join as well, especially after 911. He reenlisted while deployed in Iraq and received a purple heart while on deployment. Luckily, he and his squad members walked away from an attack with nothing more physically severe than broken bones but the experience reinforces Richard’s resolve to never take anything for granted. “I’ve lost friends to accidents, combat, suicide. I’ve been in the same boat and I am thankful that I’m still here. You have to live and love to the fullest,” he says. When asked what they’re looking forward to the most when they finally earn the keys to their house, Jennifer said, “I look forward to sharing this with our boys. It will be a wonderful example to them of working hard for something you want. This is something we’re putting a lot of time into. It’s a blessing to be able to build this house. People who don’t build houses for a living don’t often get this opportunity and we want to convey to our boys how special this is. We want them to grow up and volunteer for Habitat and learn valuable skills like we are learning right now.” They also look forward to giving Richard’s service dog a backyard to run free and play in. For Richard, finding out that fellow servicemen and women are not only helping build his house but fundraising for it was surreal. “The fact that veterans who, I think, deserve this more than I do, and are doing this for me, is unbelievable. 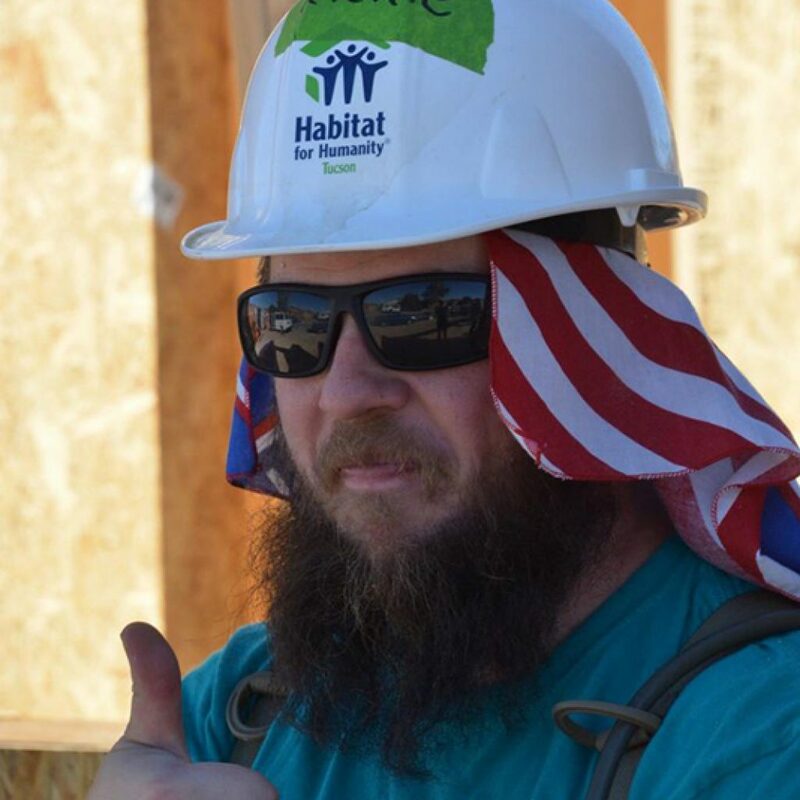 Habitat for Humanity Tucson’s Veterans Build partners with military service members, their families and the families of the fallen to reinforce strength and self-reliance. Click here to help build Richard and Jennifer’s home and support a veteran who has served our country selflessly.